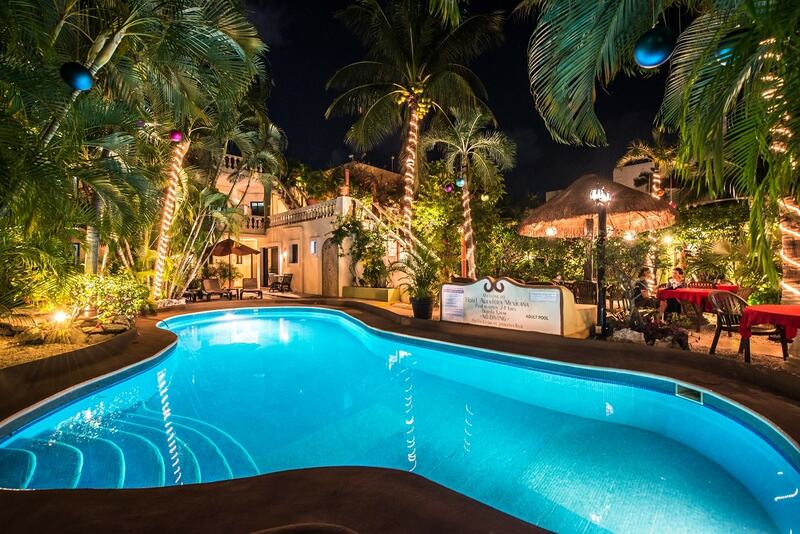 In the heart of Playa del Carmen, this charming hotel is minutes from the beach and attractions. This is one of the top hotels for Playa del Carmen on Trip Advisor. Offering excellent service in a prime location, the Aventura Mexicana will be your home in Playa del Carmen. This cozy boutique hotel offers comfortable guestrooms, a beautiful courtyard with pools, gardens and a waterfall. The comfortable guest rooms at the Aventura Mexicana offer one king bed or two double beds. Most offer a balcony or terrace. All guest rooms and suites include in-room Wi-Fi, air conditioning, ceiling fans, safety deposit boxes, flat screen TV's, and phones. Each room has their own private bathroom. The suites are a larger room, equipped with one king bed, and include all the amenities of the guestrooms. Continental breakfast is included in the rate. The Mayan Bistro restaurant is located right across the street from the hotel and also offers lunch and dinner as well as drinks. Choose to upgrade your stay to the VIP, a special gourmet all inclusive option with made-to-order meals and premium beer, wine and cocktails. Prefer to eat out? You are steps from the famous 5th avenue and only minutes from a multitude of restaurants. On-site donation-based yoga is available. Want to treat yourself to a massage or facial while on vacation? The Xtabey Spa offers a variety of services which can be enjoyed in our tranquil garden palapa or in the comfort of your own room! Enjoy the beach, only two blocks away! The Aventura Mexicana has partnered with 3 beach clubs in Playa del Carmen, the Blue Parrot, Indigo Beach and Zenzi. Beach towels are also available at the hotel. The hotel offers discounted day passes at a nearby gym. This welcoming hotel is a great place to host your group. Contact us for rates and information.